Because I’m one of the lucky ones, Mysti Parker is letting me be part of her pre-release blog blitz. Take it away, Mysti! THEY say a lot of things, don’t they? Like don’t wear white after Labor Day or don’t fry bacon with your shirt off (that’s probably good advice, come to think of it). Most of what THEY say goes right in one ear and out the other. But, in terms of writing, when THEY say “write what you know”, it makes a lot of sense. So, that’s where The Roche Hotel got its start—from my own experience working in a hotel way back in the ‘90s. Many of these first 10 episodes are based on some very real incidents that happened during my days as a front desk clerk in a little mid-priced hotel. Sure, a lot of stuff’s made up purely from my crazy imagination, but there were 5:00 AM donuts—delicious being fresh from the bakery. Henry the Donut Guy—not real, but I wouldn’t have argued one bit if he had been! Among the many other true-to-life items that appear at the Roche Hotel are a popcorn machine, a Muzak (think elevator music) that never played at the right volume, at least one “lady of the night”, and a dead body. 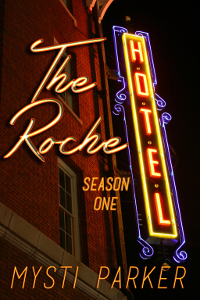 To discover all those things for yourself, from now until release day on October 15, you can pre-order your copy of The Roche Hotel, Season One for just $0.99 on Amazon Kindle! After that, the price goes up to $1.99, so make your reservation now and save a buck! Because I like parties, I’m also inviting all of you to the release day party on Facebook, October 15 from 6-9 PM EST. We’ll also have some fun and games, so I hope you’ll join me. And please bring a friend! Click HERE to Join the Facebook Release Day Party! 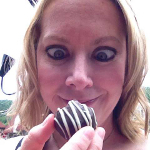 Mysti Parker (pseudonym) is a wife, mom, author, and shameless chocoholic. She is the author of the Tallenmere standalone fantasy romance series. Her other writings have appeared in the anthologies Hearts of Tomorrow, Christmas Lites, Christmas Lites II, The Darwin Murders, Tasteful Murders and EveryDayFiction. Other writing pursuits include serving as a class mentor in Writers Village University’s seven week online course, F2K. She finished her first historical romance this spring and has one children’s book (Quentin’s Problem) soon to be published, with one more waiting for illustrations, and many more stewing in her head. When she’s not writing fiction, Mysti works as a freelance editor and copywriter. She also reviews books for SQ Magazine, an online specfic publication, and is the proud owner of Unwritten, a blog voted #3 for eCollegeFinder’s Top Writing Blogs award. She resides in Buckner, KY with her husband and three children. LIKE my fan page on Facebook! Thanks, Mysti! Sounds like fun, doesn’t it? A WRITING PROMPT FOR YOU: Write about something funny that happened to you at a motel or hotel. Maybe it wasn’t very funny at the time, but feel free to make it so. This entry was posted in Giveaway, Guest Posters. Tagged giveaway, guest author, Mysti Parker, Roche Hotel. Free Books At Goodreads, And What’s Better Than Free? hey marian, one more nice post by you, i love all things wihch provide gift for free and as i am huge chocolate devil so i would love to win these goodies at choclates.